Racers can finally live the handbrake yanking dream with the announcement of three new console accessories from Thrustmaster. Helping racers of all types reach new levels of realism with these great new accessories, races will feel more authentic and drifters will be in handbrake heaven. First up is the new TM Racing Clamp which is built with the usual Thrustmaster quality, this time it comes with support for the aaforementioned hand brake mod. The TM Racing Clamp is a truly robust and practical solution that allows for optimal installation and easy use of the TSS Handbrake Sparco Mod, TSS Handbrake Sparco Mod + and TH8A, even without a cockpit! Designed for desks or tables that are between 0.6”/15 mm to 2”/50 mm thick, you can adjust your equipment according to your driving style to create a fully immersive driving experience. The TM Racing Clamp works equally well for left-hand or right-hand drive configurations depending on the position of the TH8A and TSS HandbrakeSparco: change the height, depth or inclination for greater playing comfort to maximize your performance. This 100% metal accessory installs via quick fastening with two screws and will optimise your gaming experience while ensuring safety and stability, all for just £99.99. Secondly, arriving a month after the clamp is the TSS Handbrake Sparco Mod. This revolutionary new device is compatible with both Xbox One, PS4 and PC and has only been made possible due to close collaboration with Sparco. This has only been made possible through the development of a proprietary cable needed to enable communication with console and will also take advantage of the previous model’s features, including Thrustmaster H.E.A.R.T. technology and high-quality aluminium materials. 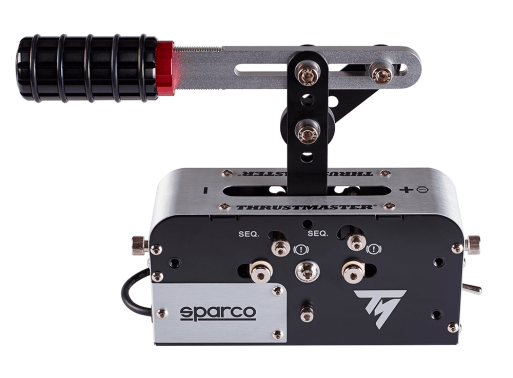 The TSS Handbrake Sparco Mod + will retail for: £259.99. Finally arriving alongside these is the TM Sim Hub, allowing the connection of up to four Thrustmaster add-ons and is designed to let players add the handbrake mod to their current setups. It’ll come priced at £44.99.